[Chicago] Evoker, Inc. is a micro-branding agency that specializes in scalable filmmaking. They help businesses evoke a human connection with their customers across digital platforms. 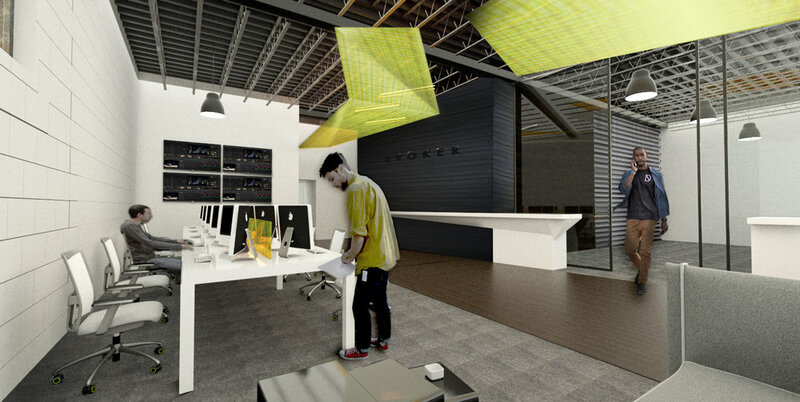 Only a few months old, Evoker looked to weetu to design their new office location in Chicago's Fulton Market which, at the time, was a raw industrial space with barrel vaulted concrete ceilings, connected to an even more raw warehouse shop space, in need of a complete interior renovation. weetu’s vision for Evoker’s space was to gradually build depth in layers, evocative to how they were evolving as a company, and express the rawness of the existing space, careful not to over develop it in order to maintain a casual, contextual, confident vibe. weetu focused on smart, flexible design solutions that could adapt for the future and implemented the project in multiple phases, meeting start-up budget constraints. As Evoker continues to grow, weetu has more of their story to tell and culture to express. “It's one thing to not only be talented but to have a unique skill set to actively listen and anticipate your client's needs and wants is more of an art than a science with weetu. I see the team at weetu as more of a strategic partner than a vendor, " says Jackson, "And they are always accessible, which is huge for me because my schedule is busy with travel and other obligations. So to be able to reach out at a moments notice, and have them respond right away to answer my questions means a lot to me." weetu has always believed that relationships matter most, valuing sustainable, ongoing service and connections. BLACK BOX SCREENING ROOM + OPEN OFFICE: Angular suspended ceiling planes back-lit with linear architectural LED lighting define wayfinding throughout the space, connecting administrative and editor suites. CONCEPT SKETCH OF OPEN OFFICE LOOKING TOWARDS SCREENING ROOM: A black, textured wood runway also connects the structures, running along the "black box" screening room, which would be clad in charred wood planks [Shou Sugi Ban]. The open plan editor suite bench office system allows for future expansion. SCREENING ROOM: The "black box" screening room interior was designed for comfort, including plush lounge seating with personal side tables and dim table lamps, and an undulating wool felt architectural wall finish that is acoustically absorptive. EVOKER CAFE: Located at the center hinge of the space, the cafe connects the entry lounge, 2nd floor administrative suite and warehouse editor suite. An intimate galley style with high gloss cabinets, white painted brick and subway tile, the cafe provides an interactive zone to chat with coworkers and grab a quick drink or snack. The stair beyond leads to the admin office and rooftop lounge located on the 2nd floor.